Cotton Creations has all your textile and linen needs for a clean, stylish, productive and efficient kitchen. Our towels are tools that can be used to clean your work space from floor to ceiling. They can also be utilized for every step of food preparation, like proofing dough, holding hot dishes and a sophisticated final presentation. Our cotton towels come in an assortment of sizes, colors, weave patterns and shapes so you can get exactly what you need. Cotton Creations stocks a broad line of flour sack kitchen towels, as well as absorbent huck towels, colored dish cloths and even the classic, striped bistro-style napkin. 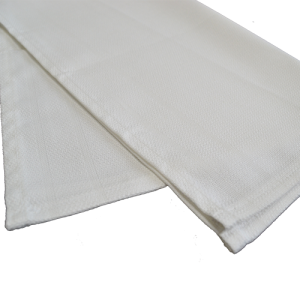 Put these linens to work for you in your home, commercial restaurant business or industrial venue space. Top-quality, cotton kitchen towels are available to all with excellent price breaks for small and large orders alike. Put good old-fashioned value and simplicity back in your home with cotton linens. Wholesale kitchen towel orders are a great way to save your family or your business a great amount of money and time while reducing the amount of paper waste you produce. From the comfort of your home, you can order a year’s supply of thick cotton kitchen towels right to your door. Forget shopping for paper towels or dish cloths… make things easier on yourself. Choose Cotton Creations! There is no need for a special code, wholesale account or business ID to get access to the extreme value of wholesale pricing. Order just once and use your towels again and again! They are clean and pressed when they arrive, so you can get right to working, baking, cleaning or even crafting. The high-quality construction allows for lots of washing and scrubbing without wearing down the towel or the custom printing. For as little as one dozen towels, you can get up to 50% off on high quality and absorbent kitchen cloths! Ask about additional bulk discounts and free shipping. Whether you need a small cotton napkin or a larger kitchen towel, Cotton Creations will help bridge the gap. Accomplish each task in the kitchen with more efficiency and simplicity; cotton towels can be adapted into any tool or instrument you may need when working with your hands. Get the right towel for the job! Choose from basic and loosely woven cloths for straining or polishing, or thick and tightly woven towels that look great to customers and house guests. It all starts with a clean kitchen space, and for that we have tons of options for absorbent and tough cleaning towels. These cloths will scrub and grab on to dirt and liquids without leaving behind lint or scratches. When you’re ready to get started, make sure to keep a fresh, light-weight cotton towel in your apron just in case. If you are preparing freshly washed fruits to cut or bake, our cotton towels are perfect to lay out produce to dry. You can even use a cotton kitchen towel to absorb any unwanted liquids from your vegetables and other ingredients. Simply toss the soiled towels into a bag for washing! The breathable cotton of our larger size towels is perfect to use when proofing bread or straining from large pots. The rectangular sizes are nice as place mats or surface covers when working with sticky dough or staining juices. Setting up your work station and getting your ingredients prepped for the next steps is made easier by equipping yourself with Cotton Creation kitchen towels and napkins! 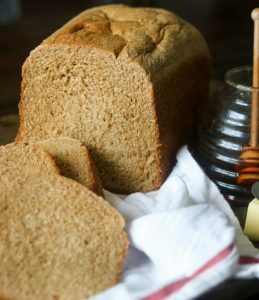 You may even use the thicker kitchen towels to grab on to hot bread, remove pans from the oven or use as a hot plate to protect your table! Clean linens are also an important part of serving a meal and enjoying the dining experience. Simply adding a plain white cloth or even a striped bistro napkin adds an elegant and upscale element to the table setting, and looks much better than a paper towel or thin napkin. Some folks even use our flour sack kitchen towels as a rustic and minimalistic serving platform for charcuterie boards or delicate pastries. To upgrade the look even more, add your monogram or a special date to your cotton towels or napkins with our custom printing services! This is a totally inexpensive and classic way to brand your business, remember a special event or make your home feel more personal. Wrap your silverware in a crisp, printed towel or neatly fold next to the glassware. We have an assortment of colors and styles to match your serving ware, seasonal decorations or event theme. Small touches really show thoughtfulness and style in your presentation! Lastly, just as we began, we’ll need some added power for kitchen and dining clean-up! Our towels work hard so you don’t have to. Easily wipe away stuck on messes or use our thinner towels to wrap and cover leftovers in the fridge. Cover up fresh breads or wrap up lettuce… our towels can help you reduce the need for plastic bags and disposable food storage containers! Why not upgrade your kitchen? The simplest and most ecofriendly way to do so is replace your paper towels and napkins with reusable cotton cloths. The benefits are never ending when you have cotton kitchen towels handy in your home; save money with reusable towels, enjoy the comfort of 100% pre-washed cotton, save time running to and from the store and reduce your contributions to paper waste! We are offering two new kitchen towels at Cotton Creations that beat out the absorbency and resilience of any paper towel or cotton rag: the 18” x 33” Absorbent Cotton Towel and the 17” x 31” Cotton Huck Towel. Don’t let the bright white cotton and super soft fabric fool you, these utility style, rectangular kitchen cloths are built for those tough jobs! From our trusted textile partner Mount Vernon, these towels are utilized in industrial, commercial and private kitchens and bakeries across the country. Not to mention auto mechanic shops, nursing home facilities, village services and park districts, pet shelters and so many more. Thicker than a flour sack towel and with a super tight weave, spills and grit are no match for this power tool of a towel. Wipe down dirty tools, outdoor surfaces, or keep around for emergency accidents and spills. If you would like to order a single towel as a sample, we have no minimum requirement! Feel free to order as many or as few towels as you need, we have pricing to match your needs. 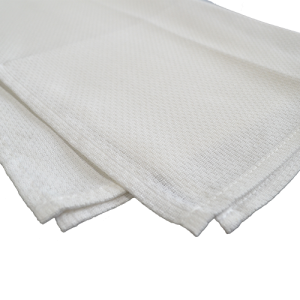 As useful as these absorbent and cotton huck towels are plain, they are wonderfully suited for customization as well. The bright white cotton clings on to paints, inks, markers and custom screen or digital printing. These are also one of our thickest towels, loved by hand and machine embroiders! The tight weave does not lose shape and supports the interlace and backings of embroidery. 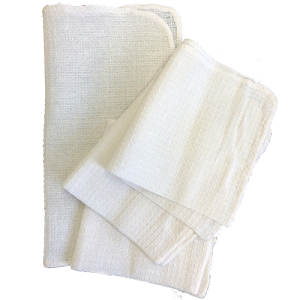 Having a crisp white, personally embroidered towel sets a distinguished and high class tone to any restaurant table setting, wait staff uniform, or bathroom hand towel. Exceed the standard your guests expect in the food service industry, or add a touch of sophistication and personalization to your home. With a versatile, consistent product line and highly detailed customization, Cotton Creations is the best place to stock up on wholesale plain or personalized cotton kitchen towels! Folks just love the vibrancy and durability of our colored cotton kitchen towels! Our right-hand manufacturer, R&R Textiles, has perfected the simplicity and practicality of the kitchen cloth. The breathable weave of these 100% cotton towels allows for flexibility while still be absorbent. The dyes are long-lasting and won’t come off on your hands or kitchen surfaces! Even after a few trips in the washing machine, your towels will remain boldly colored and securely woven. Choose from aqua, gold, hunter green, lime, purple, rainbow, red, royal blue and tangerine! 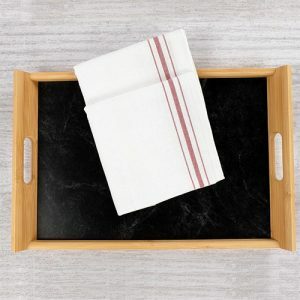 The 18” x 28” rectangular size is ideal for kitchen presentation; Tri-fold your colored towel and display on the oven rack, next to the sink or on the kitchen island. This size drapes nicely over surfaces to dry dishes, catch drippings and condensation. Mix and match your plain kitchen towels for a fun and colorful design element in your home. We also have our colored cotton dish cloths that are fashioned from the same 100% cotton, brightly colored fabric as our towels. 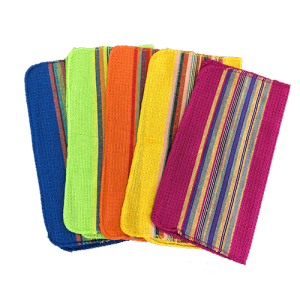 The colored dish cloths come in a convenient pack of 2 for added value! Purchase as few as twelve 2-packs, or 24 cloths total, for a 33% discount. 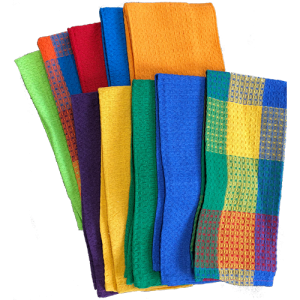 These cloths are lint-free and come in a smaller 12” x 12” square size in striped gold, lime, magenta, royal blue and tangerine. Create a matching set by pairing with the larger colored kitchen towel. This size is just right for covering up mixing bowls or polishing glassware! A simple square cloth can be a replacement for any paper towel or napkin you may need in the kitchen. The towels are pre-washed and pre-shrunk, making them food-safe and soft. These cotton dish cloths are also fun, bright accents in any bathroom, camper, or themed party. If you’re looking to order crafting towels by the dozen or by the hundreds, these linens are brightly colored and suitable for all kinds of projects. Our colorful cotton cloths are suitable for stamping, printing and embroidery, but can also be an eco-friendly tool for clean-up. You won’t find prices on quality towels like these in stores! Stock up your craft or baking supply store with blank kitchen towels and offer an essential item for a great price. Create your own unique towels to sell online or at local craft fairs; these color options are sure to match any home or business décor. Visit our Design Station and customize a classic flour sack towel. You can add an image, family recipe or decorative text to enhance the personality of your kitchen or to give away as a thoughtful gift. 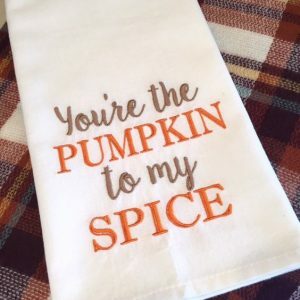 Match your personalized Craft Basics Natural or Bleached flour sack towel with colored kitchen towels and dish cloths! To top it all off, add an apron to your kitchen themed gift. 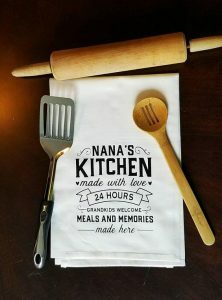 This makes a wonderfully unique present, and if you need some help designed you can check out our original pre-made 8 Piece Personalized Kitchen Towel Sets! Another new addition to the Cotton Creations lineup of kitchen towel all-stars is the classic Striped Bistro Napkin from Mount Vernon! Available in white cotton with either black, royal blue or red striping. Similar to our beloved flour sack towel material, the bistro napkin is made with a rustic yet gentle cotton fabric that gives a country feel to your space. The cotton is not abrasive on surfaces, glass or skin but is woven tightly for a powerful and durable performance. Use to wipe down tables or bar stools in your diner; the classic farmhouse stripes down either side give an added vintage detail that looks great even after lots of uses. The handy 17” x 24” size is great to keep in your apron or hang on a hook or oven for quick access. Keep a clean basket of towels rolled neatly in the restroom for drying hands, or have your team use them for a thorough and quick clean. While the Bistro Napkins perform well, they also look super attractive and traditional. If you are using these towels as a decorative or serving element, rather than for cleaning, you can accomplish a rustic and minimalistic presentation that is very trendy. Wrap up fresh breads, lay out to display a cheese selection, line a bread basket or fold and place under shared appetizer plates. These towels are reminiscent of country chic and classic diner-style establishments. Give your home or business that same nostalgic feel without hurting your budget. For a little more detail, add your logo or icon onto the cotton kitchen napkin! The Bistro stripes can be a great match to lots of logo designs and color schemes, and our high-quality water-based printing puts your logo into the cotton for a seamless and long-lasting imprint. Upgrade the professionalism and personality of your food service establishment or give a rustic housewarming gift. Personalized cotton dish towels are a time-tested and eco-friendly kitchen tool, custom gift and design element!